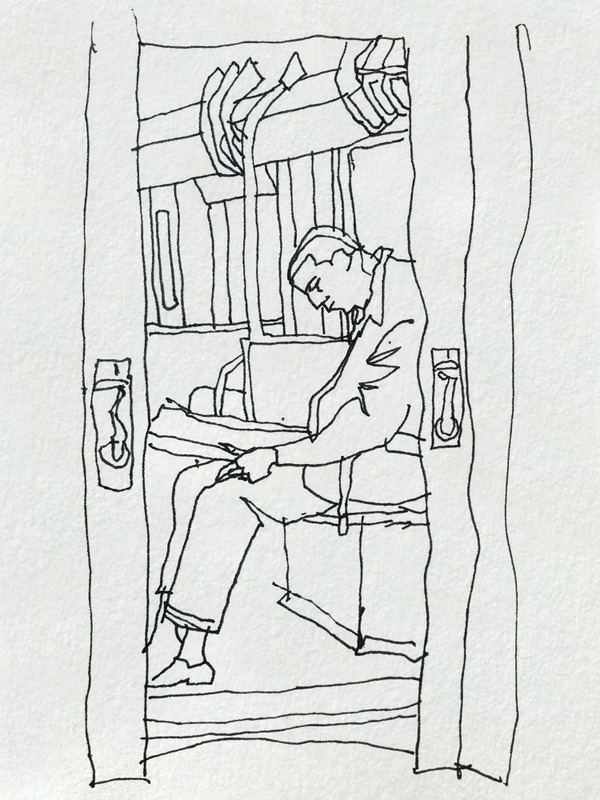 The title of the little poem by Ezra Pound is “In a Station of the Metro.” I wonder if artist Andrew Sanders thought of it when he was drawing his subway series sketches in the New York City underground. But then I think, no. It’s not like he’s conforming to any literary or other model in these sure-handed ink on notebook paper drawings. Yet the Ezra Pound poem is a near-perfect analogue, as to subject matter, as to minimalist form. The subway drawings are little imagist poems. Direct, unadorned, reduced to essentials. Poems a few lines in length. Incomplete, one could consider. Fragmentary. Part of a facial profile here. Part of a more complete figure there. A man holding a newspaper in front of him, the flap of his overcoat—all you see of the bottom half of the garment, the bottom half of the man—trailing downward in a single squiggly line. A girl wearing a flower. Just her head and shoulders, and the flower. Subway riders seated and standing, in oblique perspective often, viewed from the side or the back. Sometimes with a humorous note. A man with his anatomy half in the aisle, half in his half of a double seat, to accommodate the possibly extra-large-volume woman occupying the other seat and then some. We only see her head and neck above the seat back. I have often thought a significant inspiration source of the imagist poetry school that developed in the early twentieth century must have been the more or less concurrent scholarly discovery and appreciation of relatively large amounts of pre-Classical-era Greek lyric poetry—school of Sappho, et al.—which was usually in fragmentary form. Incomplete lines and verses, in some instances just a few words, in others a single word. But because of the patent excellence of those ancient poets—based on extant less-fragmentary examples and the high repute in which they were held by readers nearer Classical times who had a more complete corpus of the poems and in more complete versions—whatever remnants turned up were treasured and pored over and interpreted, to the point that often some sense could be made of them. And in the process, a general appreciation grew concerning fragments. How bits and pieces of text lacking context could still yield meaning. Maybe in various ways, various directions. But all the more poetical for that. In the quality of ambivalence, ambiguity. 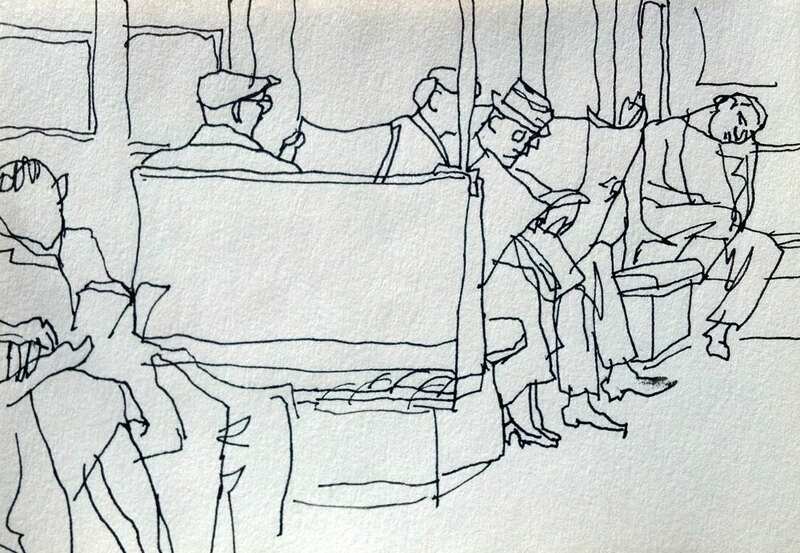 Several dozen of Sanders’s subway series drawings are currently on view at the Art Dialogue Gallery. Sanders, an artist in several media who had extensive Western New York connections—he was a member of the Buffalo Society of Artists and Western New York Artists Group and exhibited over the years at numerous local galleries—died in 2010 after a long struggle with cancer. In the late 1990s he made a famous photographic series on the last blacksmith shop operating in Buffalo, on South Park Avenue in the Cobblestone District. Operated by blacksmith Edmund Rudnicki. 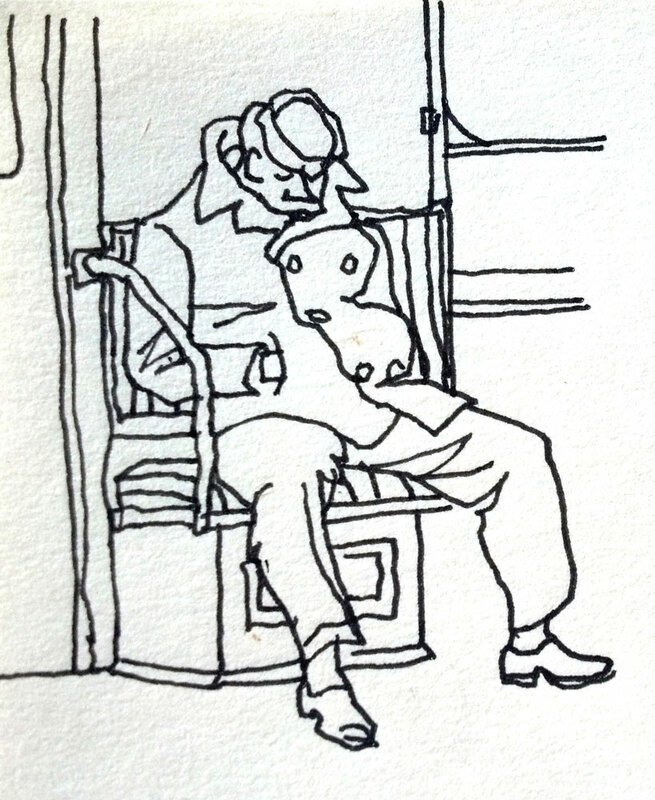 The subway series drawings are from the decade 1960-70. In a magazine interview, Sanders once talked about his aesthetic rationale for the sketchy unfinished character of this work. “There are several reasons for the incomplete areas,” he said. “evidence of the process, visual tension, economy of means and design. In my totally complete line drawings I began to notice that the final result looked as though it had been effortlessly achieved. When a section of the drawing was left undrawn, a degree of the difficulty required to complete the drawing became apparent.” So much for ars est celare artem. The Sanders exhibit continues through March 13. In the adjoining gallery space—the Western New York Artists Group space—is the group’s members show. Including a wonderful oil-on-canvas still life with peppers and tomatoes by Ann Stievater; two skeletal figures amid dense red surround abstract by Joan Fitzgerald; single-figure painterly semi-abstract by Bruce Philip Bitmead; a through a scrim curtain brightly effect depiction of a forest of birches in winter under a full moon by Susan Quaintance; and Bill Krause’s solid monotone areas and black outlines Girl With Red Hair, among other fine work. The members show continues through February 6.